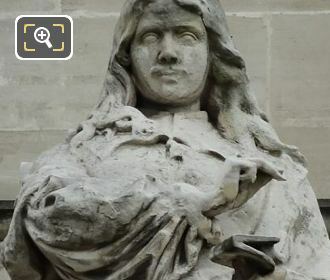 This time we have put together some HD photos showing the statue of La Rochefoucauld, which was produced by the sculptor Girard, are is also located on the former Palais du Louvre on the Aile en retour Turgot facing the Cour du Carrousel in the 1st Arrondissement of Paris. 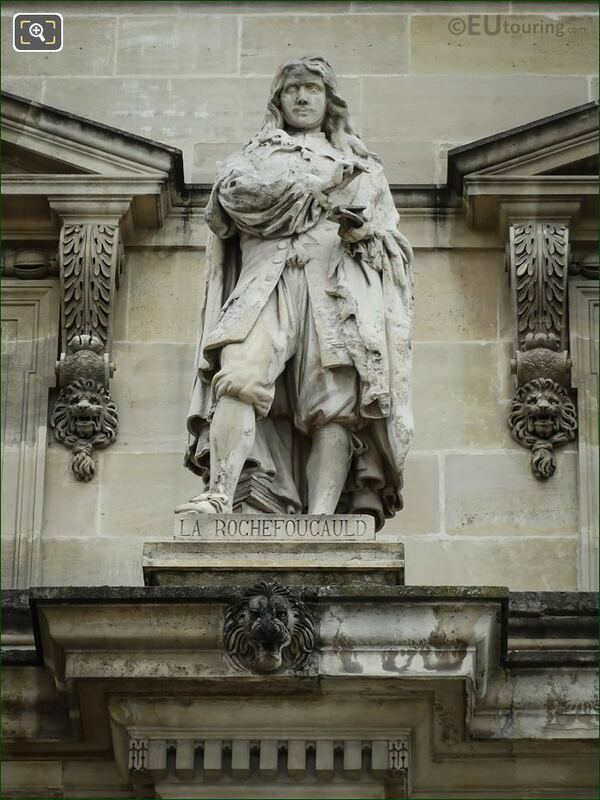 In this high definition photo you can see the statue of La Rochefoucauld, which is located second in from the right on the first level of statues on the facade of the Aile en retour turgot, which is a part of the Musee du Louvre buildings going around the Cour Napoleon. 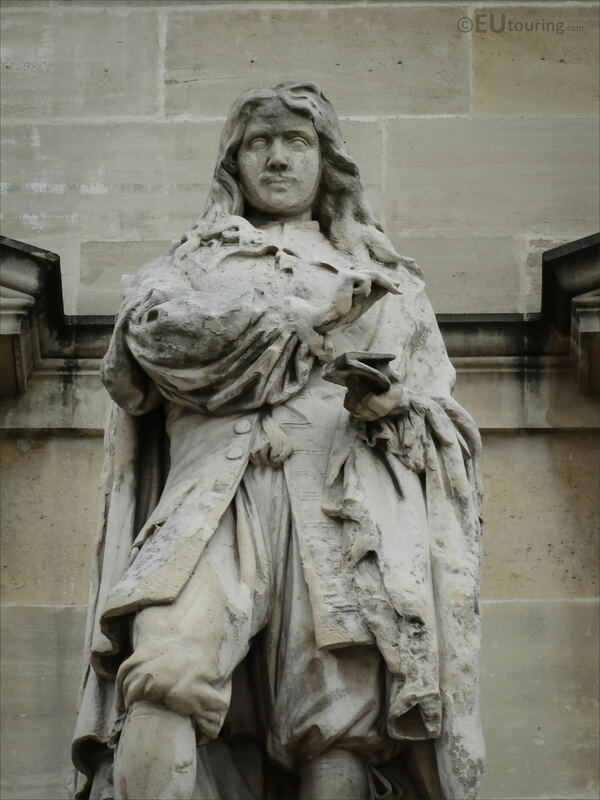 And this stone statue was produced by the French sculptor Noel Jules Girard who was born in Paris in 1816 and was awarded third prize in the Prix de Rome in 1842 and went on to produce many different statues presented at salons and Universal exhibitions before passing away at his home in the 18th Arrondissement in 1886. 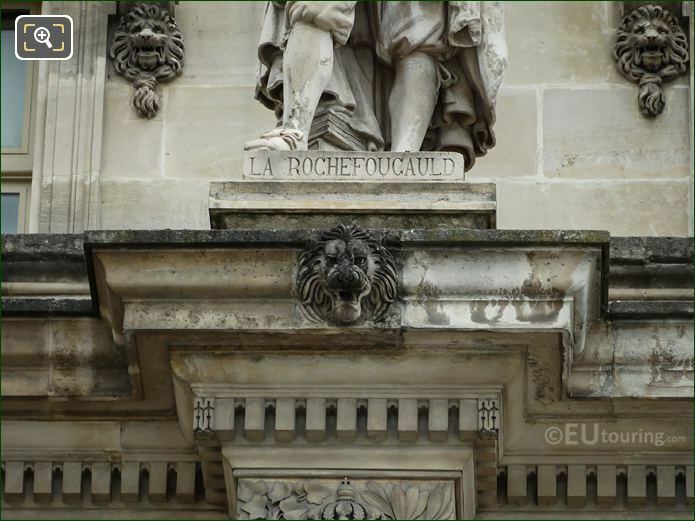 And as you can tell from this close up photograph showing the base of the statue, this is dedicated to François VI, Duc de La Rochefoucauld, Prince de Marcillac, also known simply as François de La Rochefoucauld, who was born in 1613 and became a writer, known for his memoirs and his maxims, even though he also had a military career after being educated as a nobleman.